These skull-shaped Halloween rice krispie treats are so scary … scary good that is! It all starts with the perfect combination of a chewy, crunchy rice krispie treat that’s not too sweet. Today, I’m sharing 5 easy tips with you so that you can make Halloween treats for school or for your next party! Decorate these easy Halloween treats for school, with a few simple tips. Check out the close-up of this edible bloody cleaver! The blood is made of edible red sparkle gel. WATCH MY RECIPE VIDEO BELOW to see how to build this these scary Halloween Rice Krispie treats. I’m excited that Halloween is next month. To celebrate, for the next four weeks, I’ll be building scary treats for my new Halloween Party Food series. And, today is the first of four new Halloween videos. Tip 1: Put Butter On Everything! And, by that I mean, spread a thin layer of butter on your parchment lined baking pan and a wooden spatula. This will help prevent the gooey, delicious marshmallow mixture from sticking to everything. I know it’s tempting to blast the heat up so that you can start chomping down on these crunchy rice krispie treats sooner. Resist the temptation! It only takes a 2-3 minutes for the marshmallows to melt and slowly stirring it helps prevent burning. Tip 3: Throw Away Your Spatula And Dig In! It’s time to use the best tools that you have– your hands! Personally, I love crunchy rice krispie treats over super dense, chewy treats. If you’re like me, lightly flatten the rice krispie treats with your fingertips. If you want super dense Halloween rice krispie treats, then pack them in more. Just in keep mind, no one wants to bite into a hockey puck, so go easy. Tip 4: Work Fast. It’s Time to Skull-It-Up! While your rice krispie treats are slightly warm when you touch them, quickly cut 8 skull patterns. I’m using a 3.5-inch cookie cutter. Tip 5: Let It Cool! When the skull is cool to the touch, then add the 8” treat stick to the bottom of the skull. 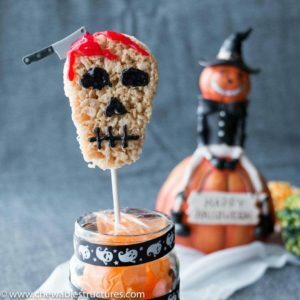 If you add the treat stick to a warm rice krispie treat, the stick will fall out. 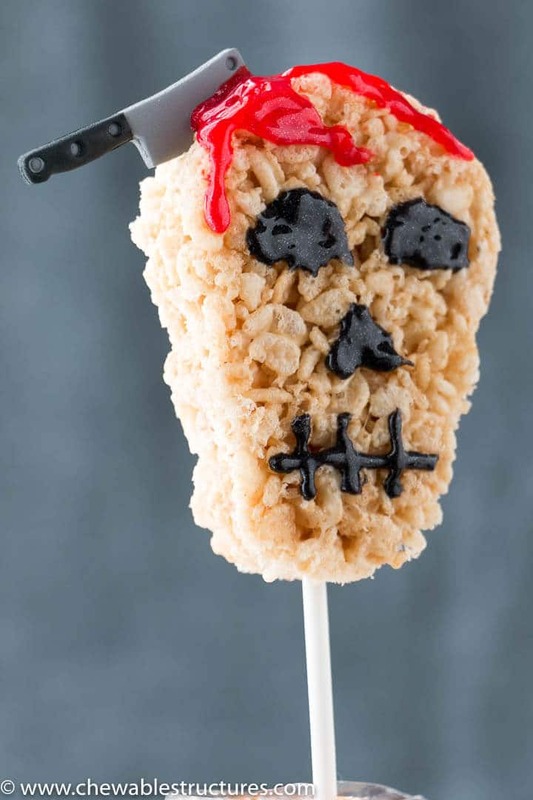 These skull-shaped Halloween rice krispie treats are so scary … scary good that is! It all starts with the perfect combination of a chewy, crunchy rice krispie treat that’s not too sweet. Today, I’m sharing 5 easy tips with you so that you can make Halloween treats for school or for your next party! I’m pumped that Halloween is next month. To celebrate, for the next four weeks, I’ll be building scary treats for my new Halloween Party Food series. And, today is the first of four new Halloween videos. On low heat, melt butter in a large pot and add the marshmallows. Tip: To prevent burning, be patient and slowly stir the marshmallow mixture until it’s completely melted. This takes 2-3 minutes. Add vanilla to mixture and stir until combined. Add the rice krispies to the pot. Using a wooden spatula, stir until the rice krispies are coated in the delicious marshmallow mixture. Turn off the heat. Immediately transfer mixture to the pan lined with parchment paper. Tip: Let cool for 1 minute. Using your hands, lightly flatten the rice krispie mixture so that the surface is level. (Note: Do not press too hard, otherwise your rice krispies won’t be light and fluffy) Let cool for 2 minutes. Tip: While the Halloween rice krispie treats are still slightly warm, cut 8 skulls using a 3.5” skull cookie cutter. Transfer to another baking sheet to fully cool (around 20 minutes). Tip: When the skull is cool. Add the 8” treat stick into the bottom of the skull. Using a sharp pairing knife cut a slit on the topside of the skull. (Watch my recipe video for a better visual). Carefully wedge the cleaver icing decoration into the slit. Using black sparkle gel, pipe the eyes and mouth onto the skull. Using red sparkle gel, pipe red lines near the cleaver to mimic blood. 1. If you make these the day before serving, then store in an airtight container in the fridge. 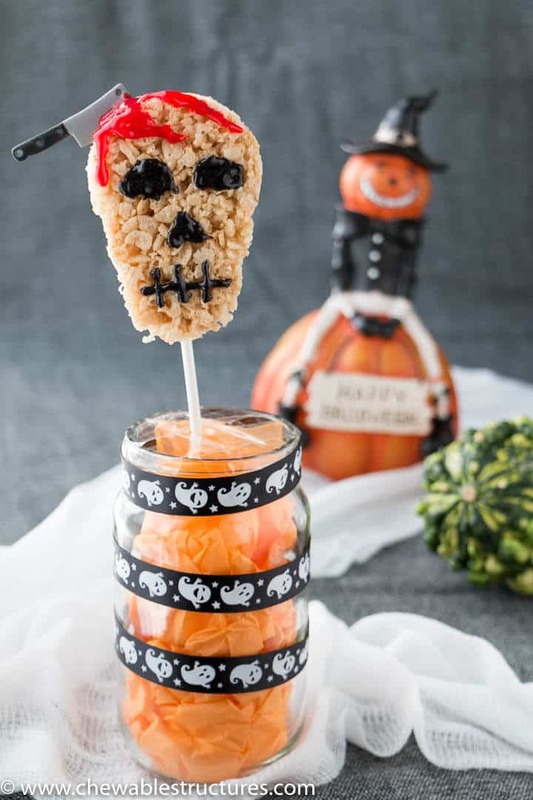 Before you serve these scary Halloween rice krispie treats, leave them out at room temperature for 30 minutes so the marshmallows have time to warm up and become deliciously chewy again.